Happy Friday my friends! 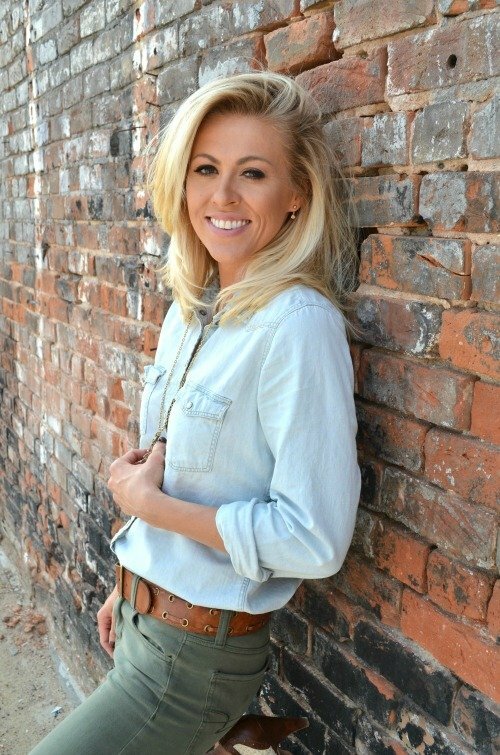 I am SO excited for today’s Friday Favorites post because I am sharing something that is near and dear to my heart, as well several sweet and thoughtful Mother’s Day gift ideas. Now I know we are still a few weeks away from Mother’s Day, it’s actually May 14th, but it’s time to start planning your gifts now. Especially if you want to do something really meaningful and special–you gotta get on the ball folks! I’ve come up with some really personal and thoughtful ideas that will work for just about any budget. And can I just say how much I love Mother’s Day? Not just because I’m a mama myself and I enjoy the spoiling, but because I think mothers rule the world. Really, where would we be without our mothers guiding us, comforting us, talking us through the highs and lows of life? I know I’d be lost without my mom and our daily conversations. There’s just nothing quite like a mother’s love and they definitely deserve to be honored on this special day. Ok, let’s get to it! First up is something that is incredibly special to me. You guys, I got this amazing flour sack tea towel from Southern Admired on Etsy and I was able to get it personalized with one of my sweet Granny’s recipe cards. This is a copy of her handwritten recipe for rice crispy treats. Didn’t she have the most beautiful handwriting? It’s just gorgeous on this tea towel. And Granny had quite the sweet tooth, so it seems fitting that we picked one of her dessert recipes. We lost her about 10 years ago to cancer, but I can still remember how soft her hands were. She had lots of antiques and her home was full of treasures. You know the vintage trunk in my front room? That belonged to Granny. She used it as her coffee table for as long as I can remember. She always had a cold glass of sweet tea sitting on it and a wooden duck. I’ll never forget that. She was a special lady and this tea towel is so incredibly special to me. I got one for myself and this one is actually going to my mom this year for Mother’s Day. I absolutely LOVE it. All we had to do was pick out a recipe and email a photo of it to Kristi at Southern Admired. It was so simple and easy–and very affordable. And I don’t know about you guys, but I think there’s something so special about an old recipe card. Maybe because they’re not used much anymore, with everything going digital and saved on Pinterest these days. But those old recipe cards from years ago seem like little treasures now. Especially when it belonged to someone who is no longer here. Talk about a sweet and meaningful gift that will probably bring some tears of joy on Mother’s Day. Recipe Card Tea Towel–info above on that one! Handwritten Personalized Cuff–I adore this idea because you can personalize the cuff with your own handwriting, your kid’s handwriting or even someone who has passed. What a sweet idea! Personalized Dish with Family Recipe–Ok, I obviously LOVE the idea of personalizing things with our loved one’s handwriting. This idea to put a handwritten recipe card on a dish or plate is absolutely genius. Mom’s One Line a Day: I talked about my love of memory books in this post–I have one and use it all the time. This one is perfectly suited to any mother. And it’s a great price! Hope Unfolding: Grace Filled Truth For the Momma’s Heart: I just ordered this book for myself and I cannot wait to get started on it. Being a mother is no easy task and this book speaks directly to the heart of every mother. Especially the one that wonders if she’s good enough. I’ve heard really great things about this and I think it would make a great Mother’s Day gift. Vintage Hand Stamped Key Necklace: You guys know I LOVE vintage key necklaces. They’re my jam. Well I found these that can be personalized with lots of different empowering and inspiring words, which I think is what every mama needs. Soooo cool. Personalized Pillow with Location: This farmhouse style pillow can be personalized with an address and latitude and longitude coordinates. I think this would be such a fun gift and perfect for Mother’s Day. Maybe you could use the address of your mom’s childhood home, or the address of a location that is really special to her. So many possibilities! Engraved Ring with Handwriting: Again with the handwriting, I just can’t help it. But how cool would it be to have that special someone’s handwriting on a ring you wear every day? So darn sweet. Personalized Leather Journal: This one is so cool because it allows you to personalize a leather journal. This is ideal if you want to get something engraved with more than just a few words. You can choose to get an entire handwritten letter or maybe even a special Bible verse put on the back on this leather journal, which I think make for an AMAZING Mother’s Day gift. Personalized Bar Necklace: If you love those dainty bar necklaces that are so popular right now you’ll definitely want to check these out. They come in lots of difference sizes and shapes and they can be personalized with just about any engraving. Great post, Sarah. I absolutely love the tea towel idea and am going to have one made for myself and my sister to honor our mother. My mother passed away six years ago and it has left the biggest hole in my heart. She had me later in life (I am the 10th of 11 children) so it has been particularly hard for me compared to my older siblings. The towel will go along well with all of the lovely things that I have that came from her. Thanks for this post. These are all amazing ideas! I have a whole stack of recipe cards from my grandma, who passed away 10 years ago, and I still miss her so much! I totally agree about the handwriting…it’s so personal and increasingly rare in the digital age. I treasure anything with my loved ones’ handwriting! Thanks so much for the great ideas! So thoughtful! I agree Megan, I treasure little notes and special things with loved one’s handwriting. In fact I have a whole stack of birthday cards I’ve received over the years because I just can’t bring myself to throw them away. Special treasures for sure! WOW!!! That flour tea towel sack is amazing, I use all my grandmothers recipes as she passed them to my mom, My grandmother used to make me stand on a stool beside her and watch every stir she would make in the pot. She used to say watch carefully you will do this one day. I just love this idea Sarah , it brought a little tear to my eye this morning and brought back some wonderful memories for me. Im going to try do this too .. What a great gift too. Aw that is so sweet Teresa, thank you so much for sharing! What wonderful memories you have with your grandmother. Those are special moments we hold close to our hearts forever! 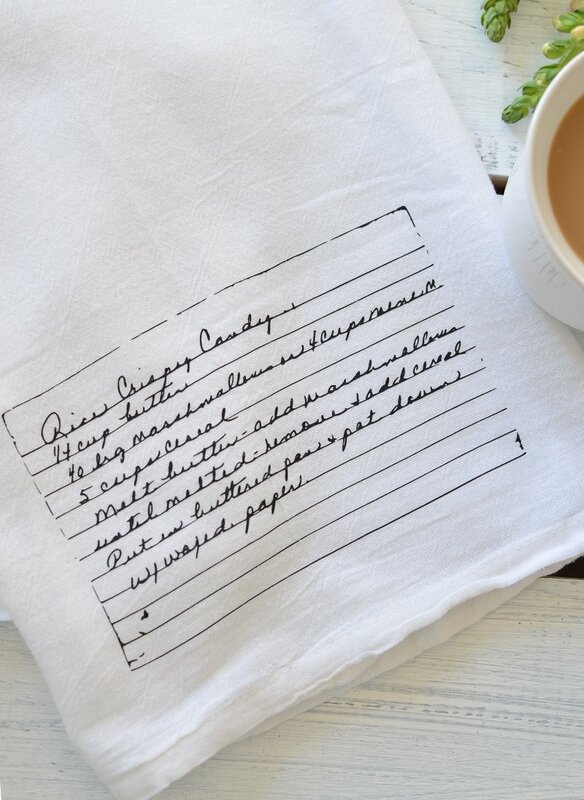 Being the mom that will receive this beautiful tea towel with Granny’s hand writing makes me cry. What an amazing gift i soon will be honored to receive! I also remember how soft her hands were, like velvet! Must have been all those twinkies she ate! Oh what sweet sweet memories. You are such a wonderful and thoughtful daughter, how I do adore you my precious daughter. 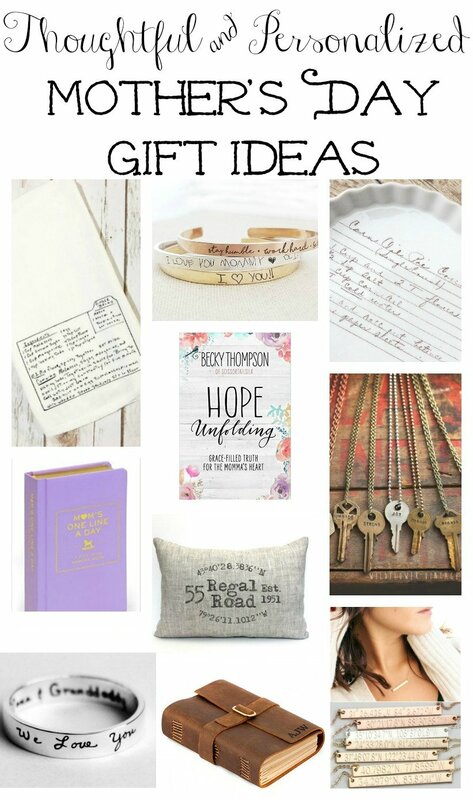 These are all such cute ideas. 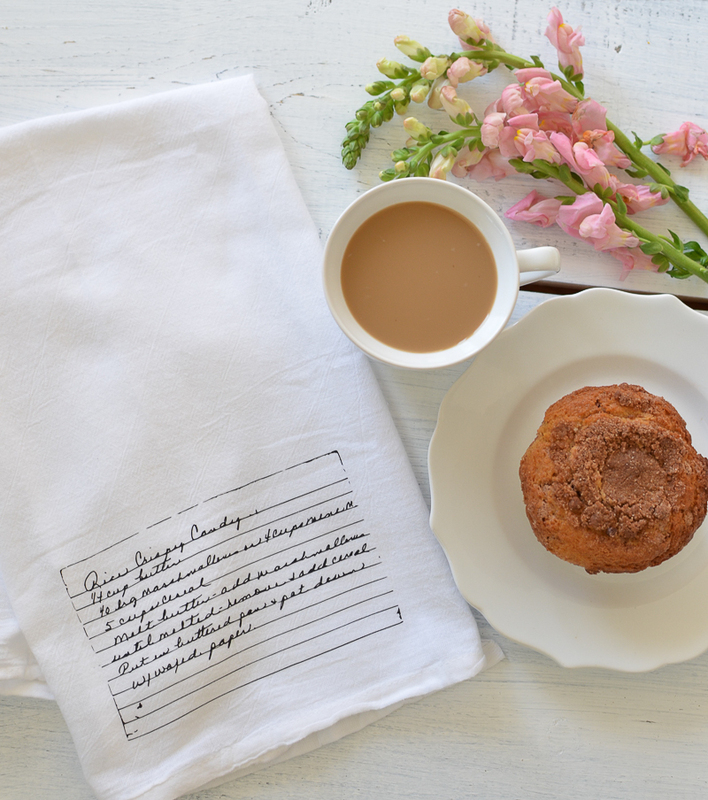 I love that tea towel, what a great way to remember someone special! Sarah, I loved your tea towel so much I am having some made. One for myself, my mom and my two daughters’. Something we can all cherish forever with our grandma’s writing. ???????? Oh that’s so awesome Doreen, I’m glad you’re getting one for yourself and your daughters. I have no doubt they will love it too! Thank you so much for sharing these awesome gifts. I LOVE the tea towels. I plan to order one for my myself, mother, my sisters. Thank you again! I always look forward to receiving your post!! Oh yay Kathy, I’m so glad you’re going to order some of the tea towels. They’re really so special! Thank you so much for being here! Hi Sarah, I just found your blog and am enjoying in so much. I love the tea towel suggestion. I did something similar for my 4 children and grandchildren a couple of Christmases ago. I took their favorite recipes of mine and their grandmothers and transferred them to an apron. Just another way to keep traditions alive in our busy lives. Keep up the good thoughts and glad you reminded us to be thankful for the small blessing in our lives.